Singlewire Software will be at Campus Safety – West, July 31 in Long Beach, California. This conference will discuss several important topics, including how to effectively prepare for an emergency, how to approach conversations on school safety with K12 children and how integrating audio and video solutions on campus can be beneficial. This event will include several key notes speakers and workshops to help prepare for situations that may arise on campuses. To learn more about the workshops and keynote speakers at the conference view the event schedule. 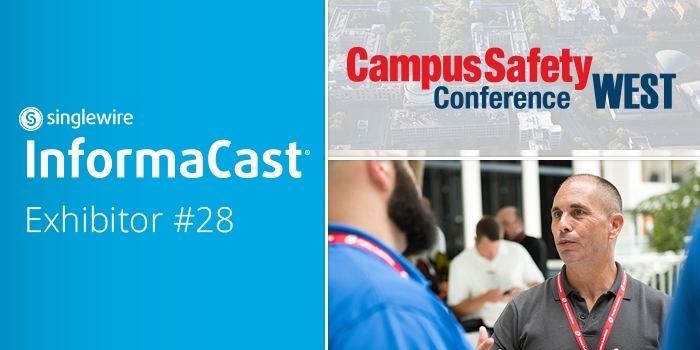 Singlewire will be at table 28 to discuss InformaCast and the importance of effective communication in a campus emergency. We will also address ways your campus can improve campus safety this summer to prepare for the upcoming school year. For more information on how campuses can better prepare throughout the year view our e-book for a 12-month guide. You can also stay engaged with event by following Campus Safety on Facebook, Twitter, and LinkedIn. During the Campus Safety West Conference, Singlewire Software will be showcasing the latest updates to its InformaCast emergency notification system. Improving campus safety to be more effective is essential, and the platform has added three important updates to increase the likelihood everyone receives an emergency notification when it goes out. InformaCast Fusion – Combine the power of InformaCast Advanced and InformaCast Mobile in a single interface that manages emergency notifications for on-premises and mobile devices. InformaCast Desktop Notifier – Send emergency notifications to desktop computers using four message types: pop-up, ticker, toast or tray. InformaCast Command Center – This web interface uses icons and predetermined questions to quickly build informative emergency notifications for common crisis scenarios. InformaCast allows for effective, precise and timely information to be received by staff and students on campuses around the world.